On June 23, 1999 Wayne Gretzky became the 10th and last player to have the three-year waiting period waived by the Hockey Hall of Fame Selection Committee "by reason of outstanding pre-eminence and skill." The Hockey Hall of Fame made it official that Wayne Gretzky had joined nine others by being inducted immediately after retiring. The Hockey Hall of Fame also stated that Wayne will be the last player to receive such an honour. Prior to Wayne Gretzky's final game, April 18, 1999, NHL Commissioner Gary Bettman set a precedent and declared that there would never be another player to wear number 99 in the league. The announcement only confirmed what everyone already knew in their hearts -- there would never be another Wayne. 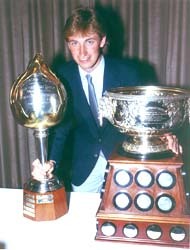 Wayne Gretzky holds or shares 61 National Hockey League Records: 40 for the regular season, 15 for the playoffs and six for all-star competition. He played for four different franchises in 20 NHL seasons. Gretzky led his teams to the playoffs 16 times, winning four Stanley Cups with the Edmonton Oilers. b. Brantford, Ontario, January 26, 1961 Centre/Shoots Left-6' 180 lbs.